On 1 October 2010 a large 8 foot tall bronze map of Vietnam and Southeast Asia was dedicated at the new Vietnam Pavilion at the United States Air Force Academy. 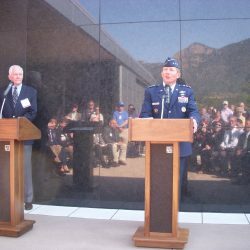 Generously donated by the class of 1970, the building and map are designed to honor the 150 Academy Graduates who were killed in action as well as all graduates and service members who participated in the war. 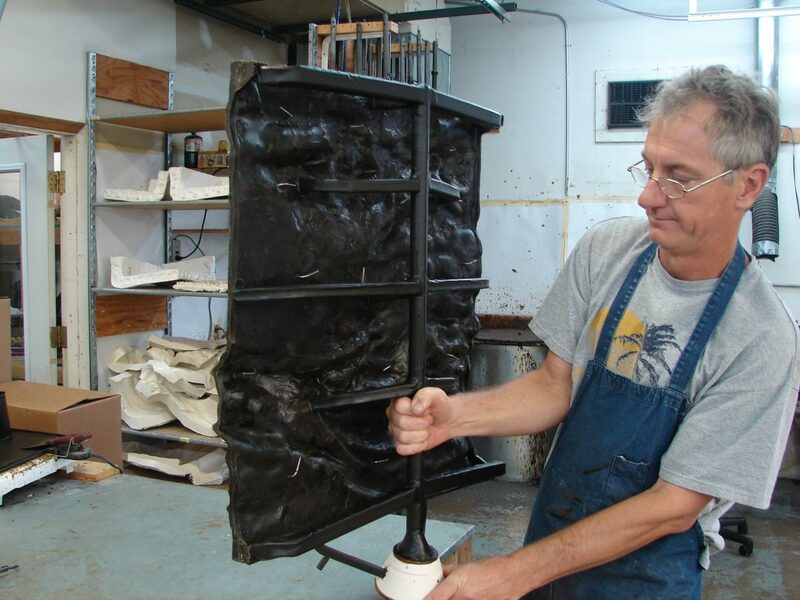 The sculpture measures 8 feet high and 7 feet wide and weighs 800 pounds. 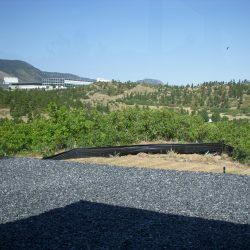 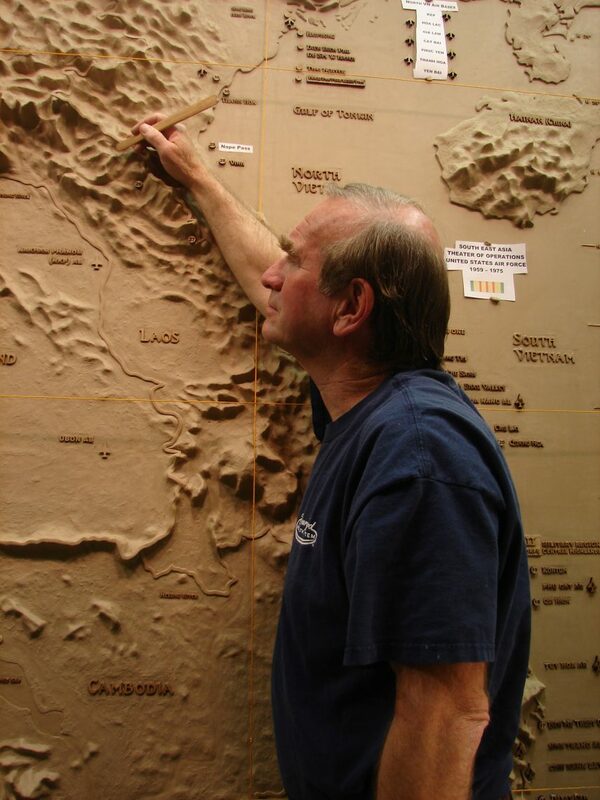 The sculptor James Nance, a Vietnam vet and former Air Force pilot, was commissioned by the class of 1970 to create the monument and took a year to hand sculpt every terrain form by referencing 490 million Digital Elevation Measurements taken from the space shuttle. 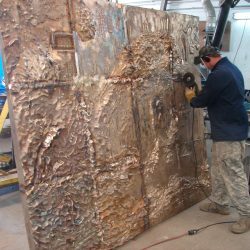 The solid feel, gravity, and permanence of bronze combined with the exaggerated vertical scale of 20x gives the map a powerful monumental presence, which invites the visitor to touch and remember. 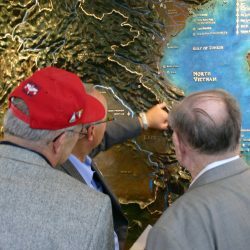 Since the dedication a steady stream of veterans and families from all services have visited the site and by touching the map have revisited their Vietnam experience with shared tears, laughter, and stories. 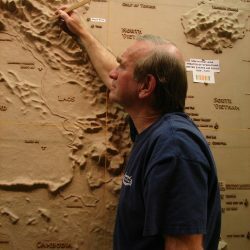 Major rivers and lakes painted blue. 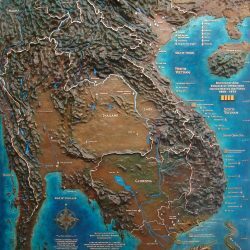 Mekong can be traced from the Delta into China. 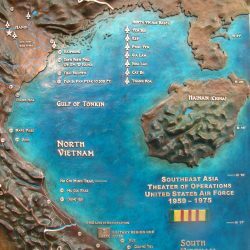 All major US airbases and all NVA air bases depicted with F-4 and MIG –21 icons. 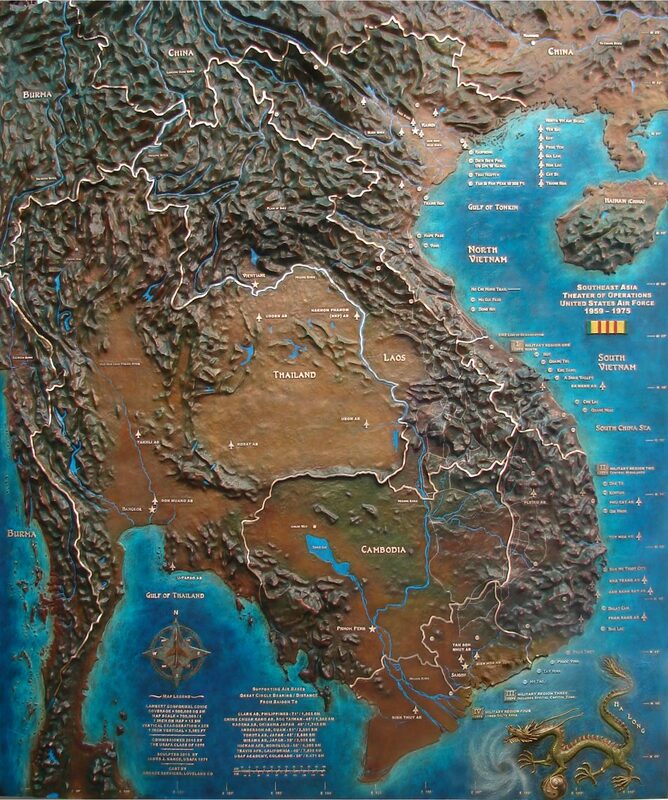 Most accurate depiction of “Ho Chi Minh Trail” network in existence, referenced by the artist directly from the commander of the North Vietnamese Army General Vo Nguyen Giap’s personal battlefield maps. 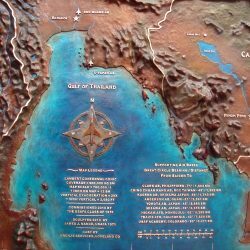 Thirty selected major battle sites and towns depicted for geographical orientation. 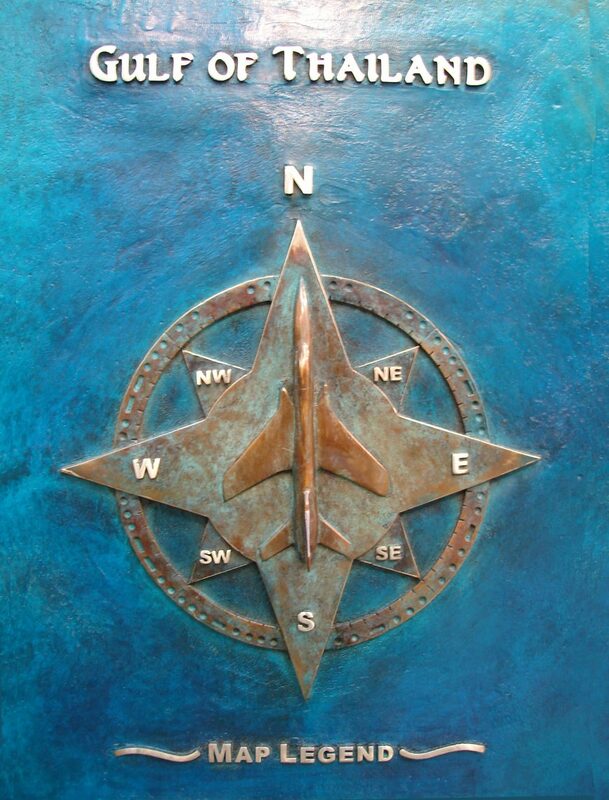 Unique hand applied, hot bronze, colored patina. 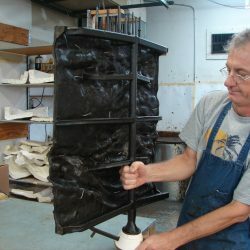 Sealed and waxed. 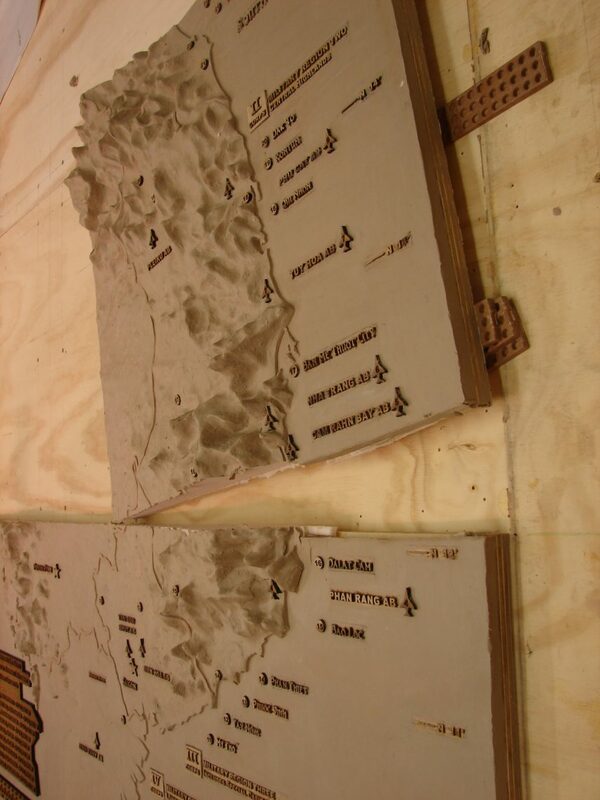 Green jungle is partially rubbed back to reveal highlights of rich French brown bronze patina on the mountain peaks. 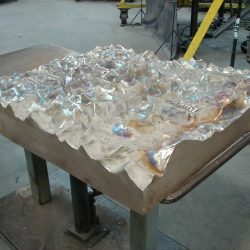 Oceans have a sculptured texture and when combined with an incredible multi layered patina (developed by the artist) has the illusion of looking into the water with coral reefs visible below the surface. 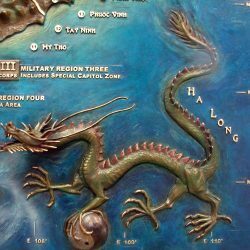 Sculpted in high relief, the Vietnamese dragon “Ha Long” measures 16 inches long and is located on lower right of panel. 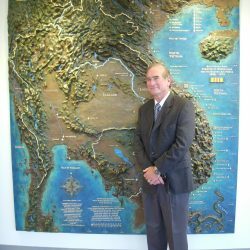 Revered by the Vietnamese people as bringer of rain and prosperity, “Ha Long” is representative of Ying and Yang and is present on the US Vietnam service medal and the former South Vietnam crest. 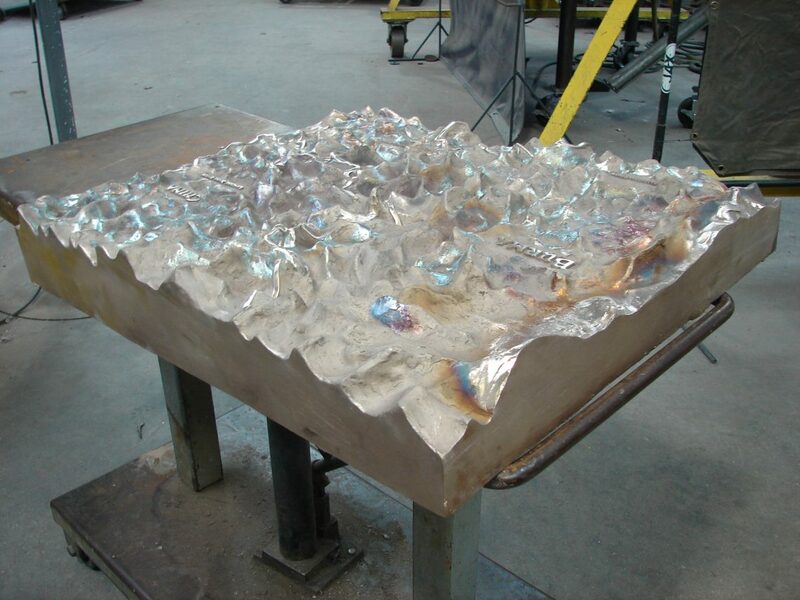 Borders delineated by a cast raised polished bronze ribbon. 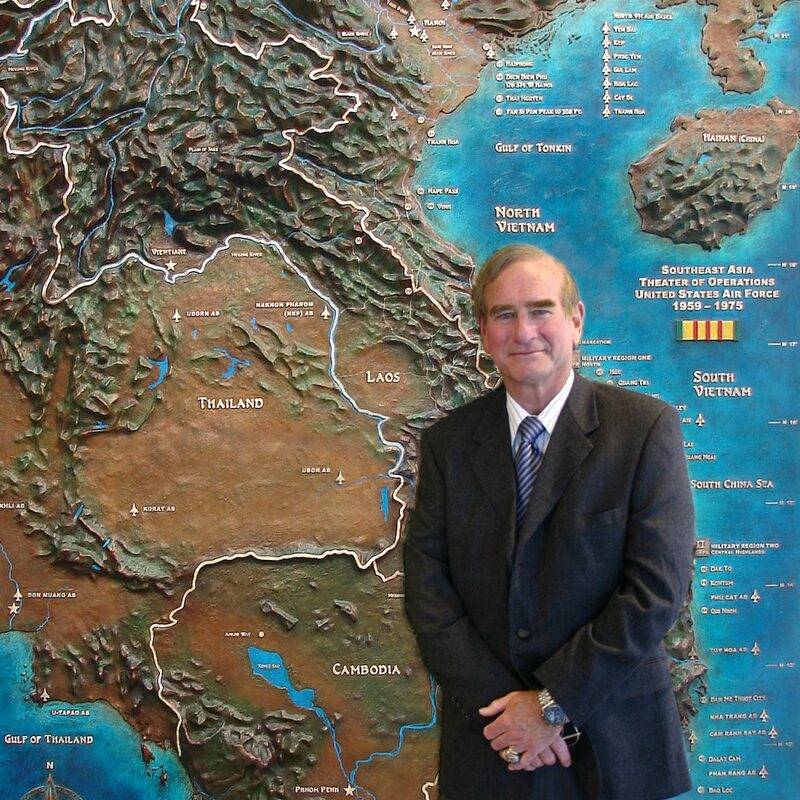 All 4 military regions, I –IV Corps, delineated with polished borders. 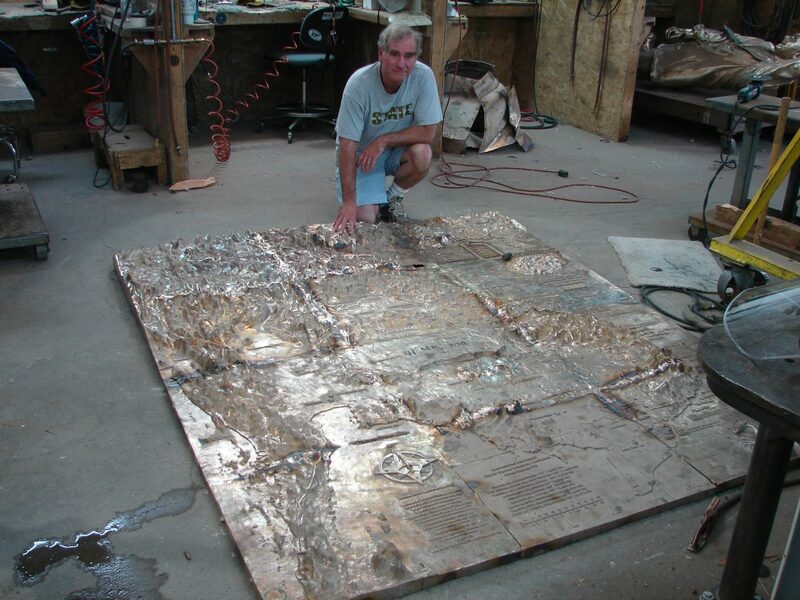 Sculptor Jim Nance shown with map, Vietnam Bronze Map by sculptor James Nance. 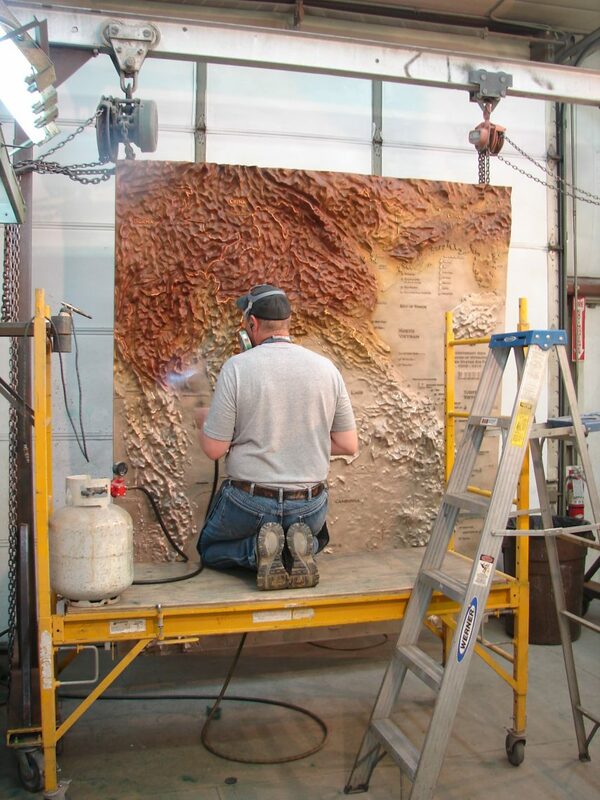 Sculptor working in clay on 8 ft by 7 ft map, Vietnam Bronze Map by sculptor James Nance. 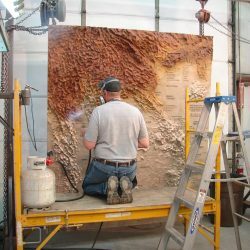 Breaking the sculpture clay apart into 12 sections for molding and bronze casting Vietnam Bronze Map by sculptor James Nance. 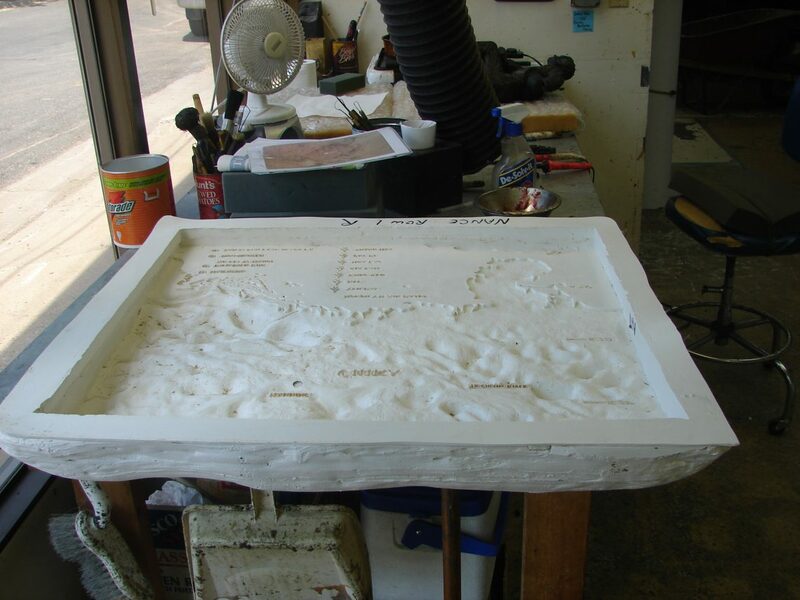 Rubber mold for one section Vietnam Bronze Map by sculptor James Nance. 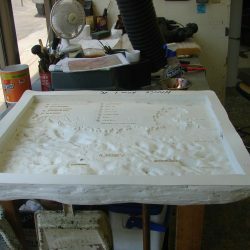 Wax poured and cast into mold, Vietnam Bronze Map by sculptor James Nance. 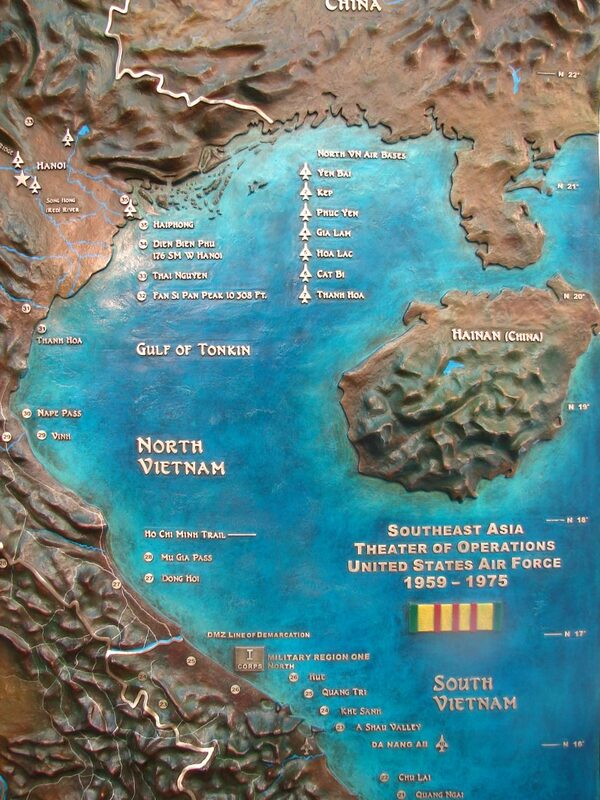 Section cast in bronze, Vietnam Bronze Map by sculptor James Nance. 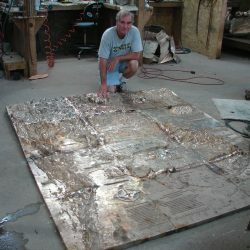 All twelve bronze castings welded together, Vietnam Bronze Map by sculptor James Nance. 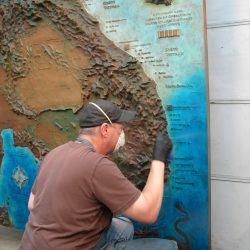 Chasing out the seam lines, Vietnam Bronze Map by sculptor James Nance. 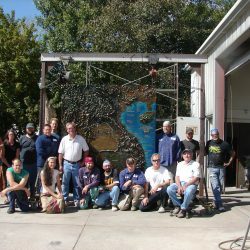 Map casting complete in metal shop, Vietnam Bronze Map by sculptor James Nance. 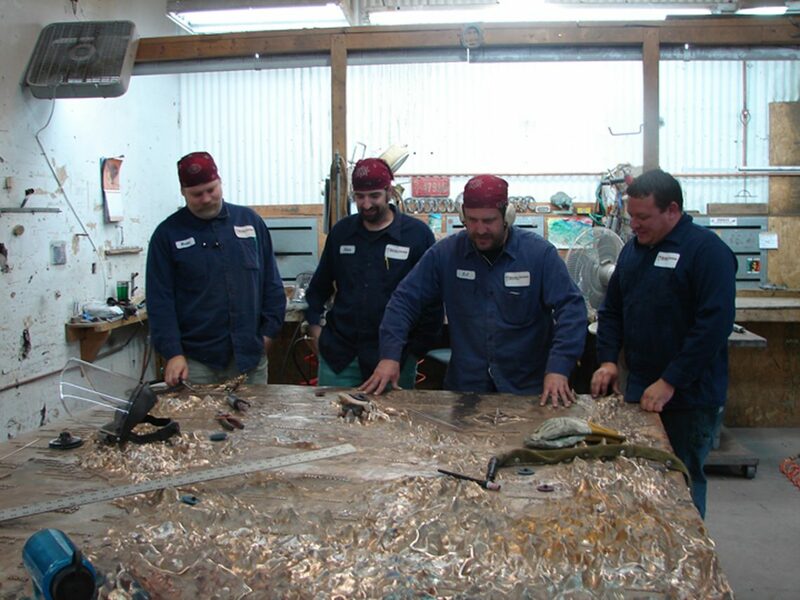 Metal shop staff at foundry checking for metal finish, Vietnam Bronze Map by sculptor James Nance. 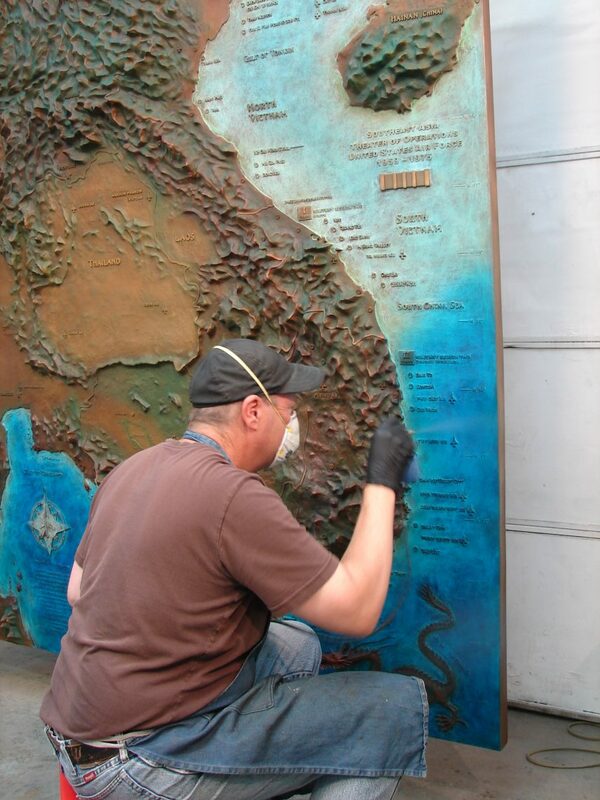 Patina started on map Vietnam Bronze Map by sculptor James Nance. 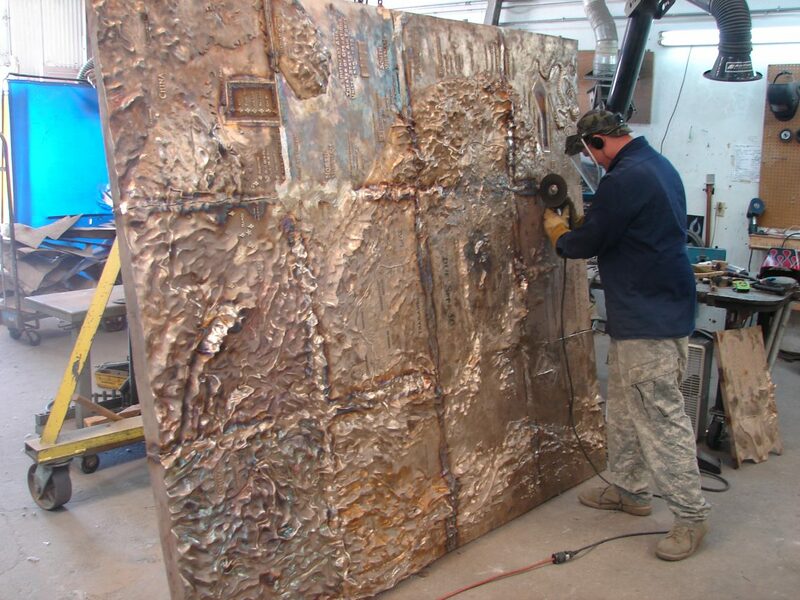 Patina almost complete Vietnam Bronze Map by sculptor James Nance. 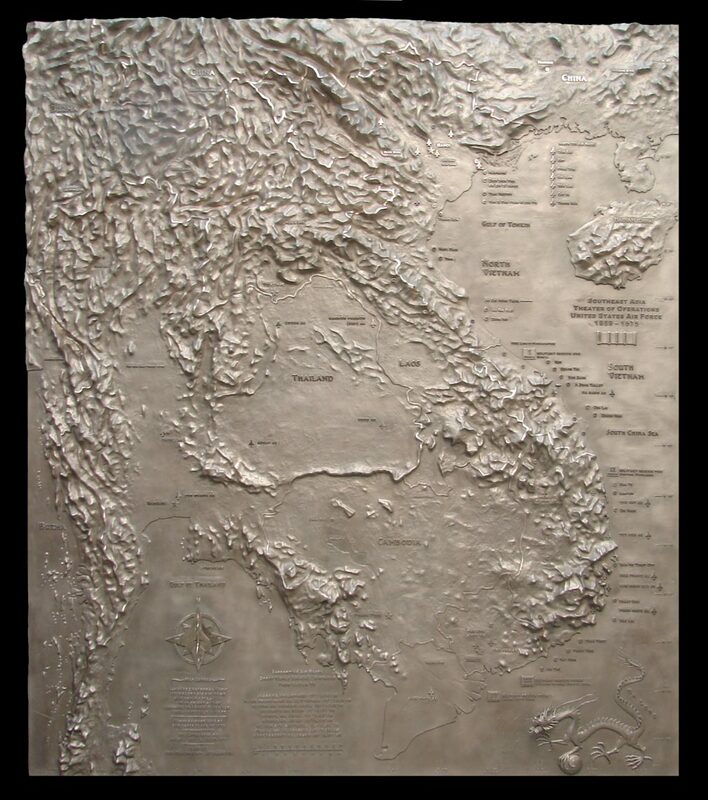 Full view of completed map, Vietnam Bronze Map by sculptor James Nance. 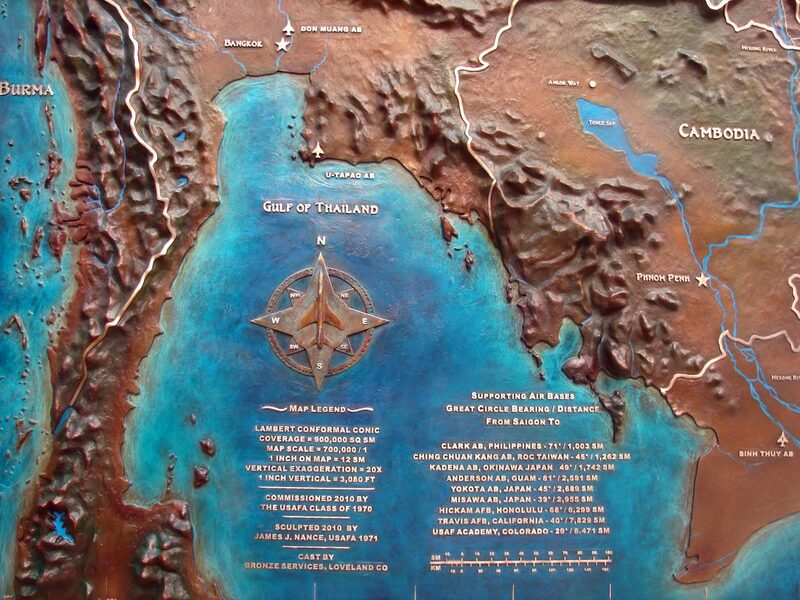 Detail of South China Sea, Vietnam Bronze Map by sculptor James Nance. 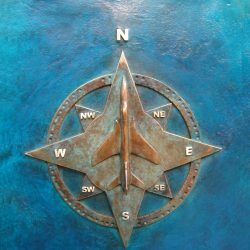 Detail of F-105 compass rose, Vietnam Bronze Map by sculptor James Nance. 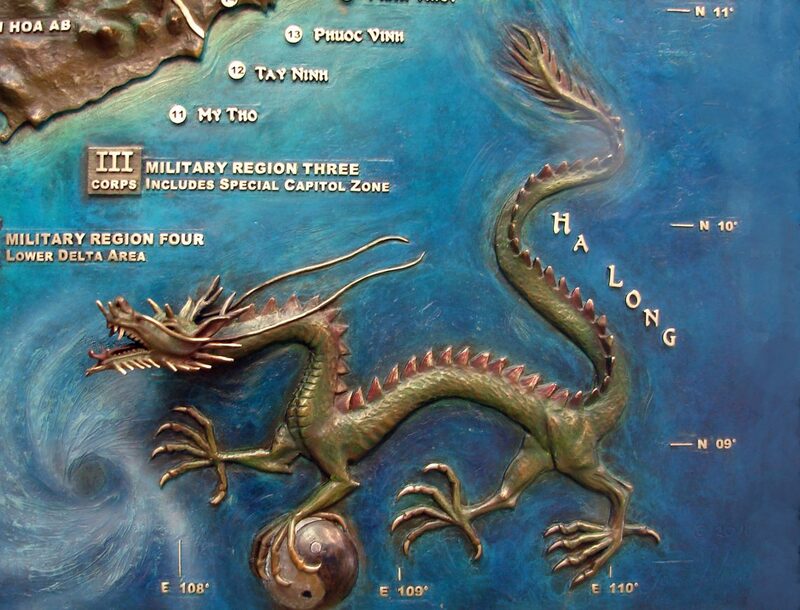 Detail of Vietnamese dragon “Ha Long”, Vietnam Bronze Map by sculptor James Nance. 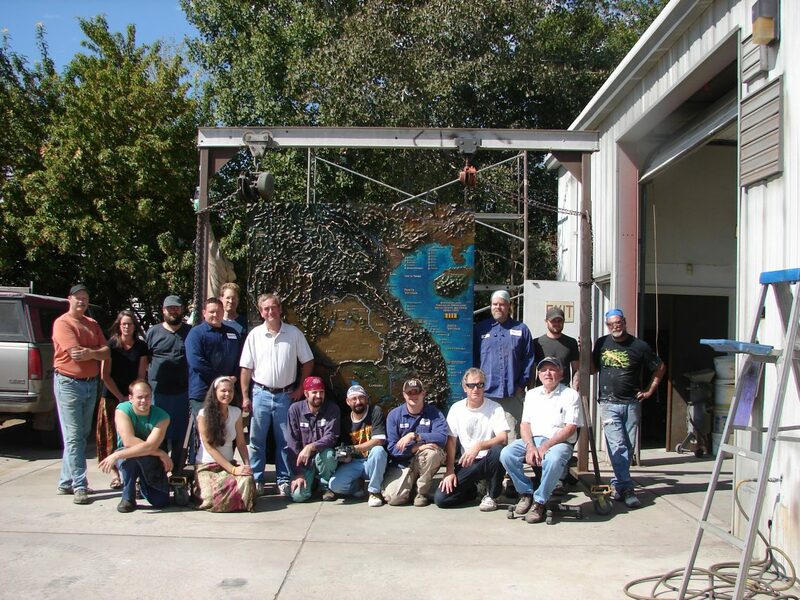 Foundry staff posing in front of completed map. 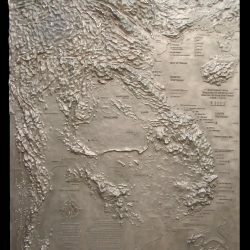 Vietnam Bronze Map by sculptor James Nance. 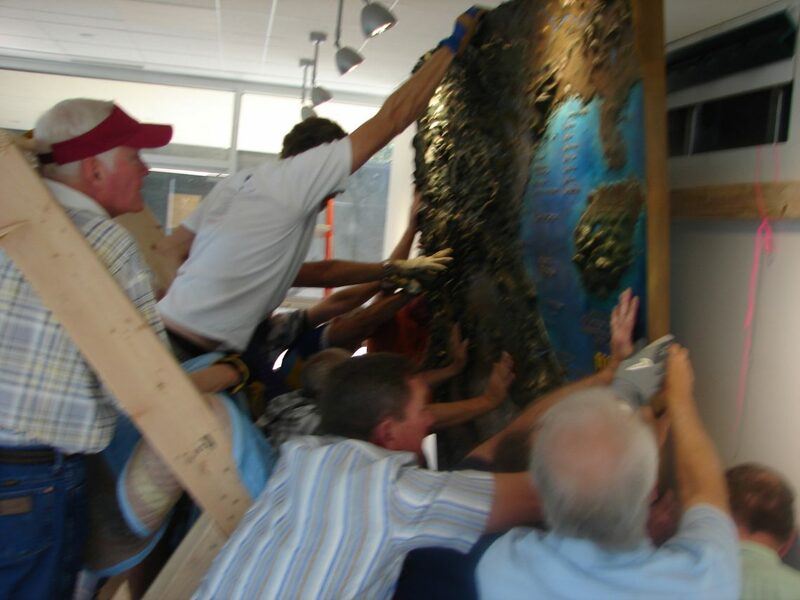 Hoisting the 800 pound map onto the wall with 20 volunteers for the USAF Academy class of 1970 Vietnam Bronze Map by sculptor James Nance. 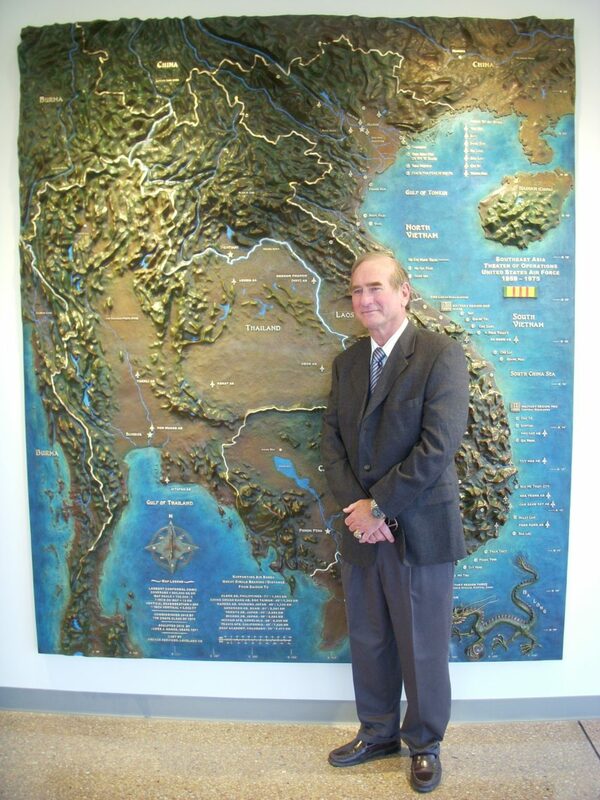 Artist standing in front of map mounted to wall of Vietnam Pavilion Vietnam Bronze Map by sculptor James Nance. 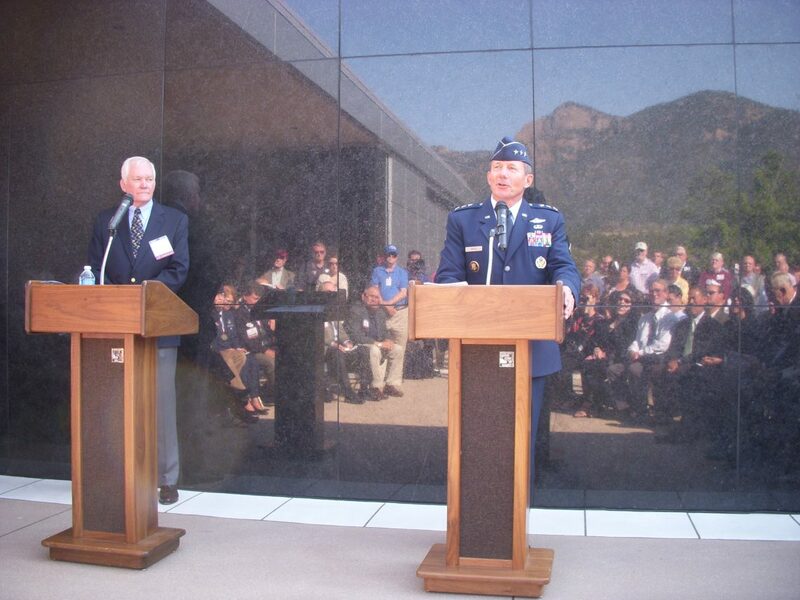 Graduate Dedication ceremony of the pavilion and ap with keynote speaker general Michael Goud Superintendent of the USAF Academy and Gary Dahlen class president of 1970, Vietnam Bronze Map by sculptor James Nance. 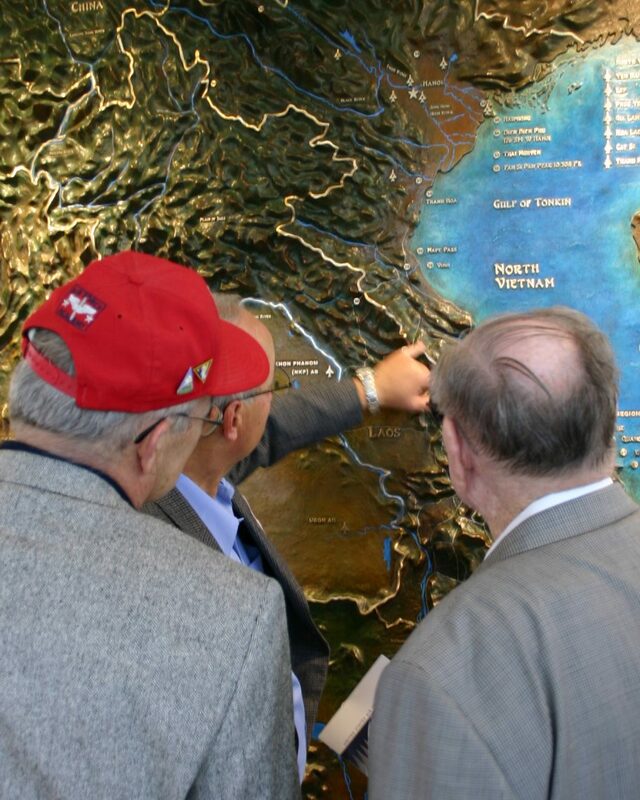 veterans of Vietnam touching the map and reminiscing, Vietnam Bronze Map by sculptor James Nance. 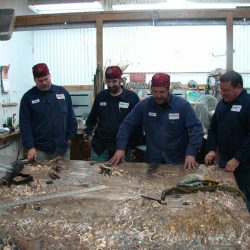 Graduate veterans of Vietnam touching the map and reminiscing, Vietnam Bronze Map by sculptor James Nance. 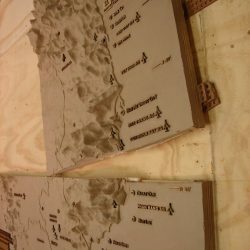 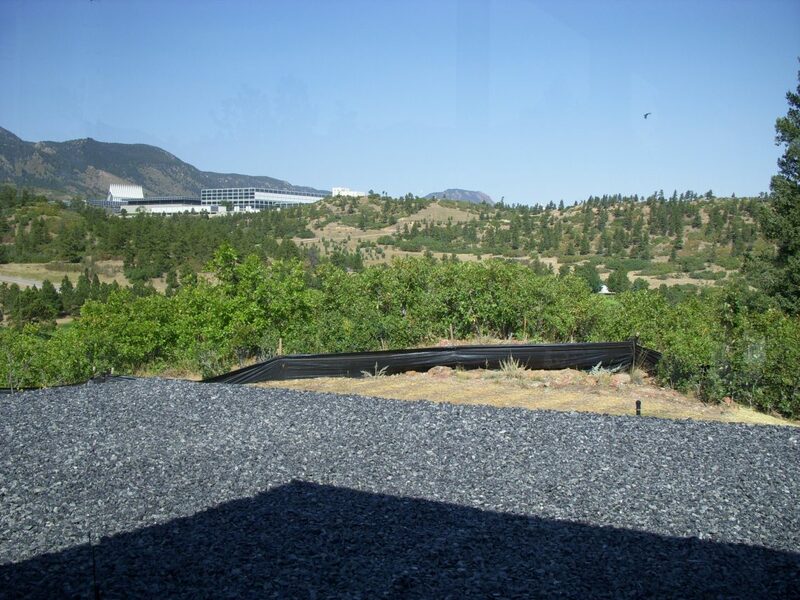 View of Academy campus from interior of Vietnam Pavilion, Vietnam Bronze Map by sculptor James Nance.